Provide high quality business education, supported by research and service activities, that enhances the economic vitality of the region. 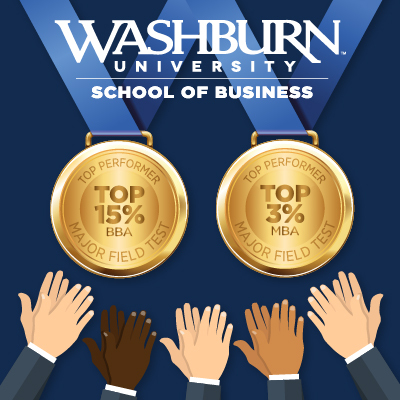 Washburn University School of Business is accredited by the Association to Advance Collegiate Schools of Business, the hallmark of excellence in business education. Founded in 1916, AACSB is the longest serving global accrediting body for business schools that offer undergraduate, masters, and doctoral degrees in business and accounting. Only the top five percent of all the business programs in the world have achieved AACSB accreditation. The Major Field Test is a degree requirement for all business students and is administered in our capstone course, BU449 Strategic Management. The test is prepared by Educational Testing Services (ETS) and is designed to assess mastery of concepts and principles as well as knowledge expected of students at the conclusion of a major in specific subject areas. Every year, more than 68,000 students from 560 institutions take the Major Field Test. For the last few years, the Washburn mean has been at or above the 80th percentile. Continually improve the quality of the School's academic program offerings while engaging students and the business community. Increase output and quality of impactful mission-based intellectual contributions. Offer new programs and infuse innovation into School of Business activities. Increase enrollment by improving the School's visibility and brand awareness.